A recent plethora of articles and reports has prompted us to believe that “big data" is full of unlocked answers, but the real power lies in finding humans who can interpret the data and create a process to translate realistic quantities of it into actionable directions for business. Let’s start with the question: What does big data even look like? Many people picture big data as the world’s largest Excel spreadsheet, with infinite rows and columns populated by unfathomably large numbers. In some cases, this is true. Data can be nicely kempt and organized in numerical form. 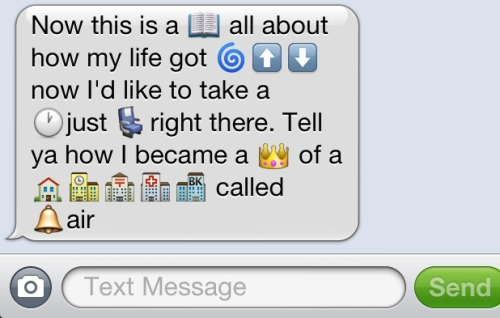 As a human (especially one who watched TV in the early 1990s), this text message is instantly understood, and quite entertaining: In fact it’s an emoji-SMS hybrid form of the theme song from The Fresh Prince of Bel Air. To a computer, of course, this information is harder to grasp. Computers accurately identify complex patterns of statistical significance that often elude humans. But computers often fail to understand implicit nuances, notice patterns from different sources and immediately identify such things as the generation-defining song pictured above. Humans, in comparison, are far better at the arts of being curious, asking questions and combining seemingly unrelated data to reveal big-picture insights. We’re also good at understanding hidden messages in language. This is why, more often than not, that the real value of big data lies in human interpretation and analysis – not the vastness of recorded history, data and computers. As a society, we’ve hoisted Big Data (capital B, capital D) onto a throne. But if businesses want to profit from it, they shouldn’t invest in one more terabyte of data. They should invest in a data analyst. Data analysts are the people who crunch big data into bite-size nuggets of actionable insights. Typically, they’re a computer-scientist-statistician or computer-scientist-mathematician hybrid; they understand the technological landscape for mining for data, but can also take that data back to the lab to see what secrets it contains. Where is the next best place for my company to expand geographically? How well did our video campaign resonate with a 14-to-18-year-old demographic vs. a 35-to-45 demographic? These experts' ability to see statistical relevance on complex, often multivariable questions makes their job as important to a businessperson as the value of the dollar to an economist. The data analyst brings meaning to otherwise meaningless information, the same way that the value of a dollar brings meaning to a currency. Some data analysts, however, say that decoding the myth of big data isn’t the most important part of analysis. Yes, "big data” is a buzzword we all swoon over. But, in fact, it can be so complex that digging alone won't provide actionable advice to businesses. What’s more important is looking into repeatable insights and analysis of smaller datasets with faster timeliness, says Trae Wallace, director of marketing analysis at Kapost. “Not big data, but fast data,” Wallace says. “We have let ourselves become enchanted by big data only because we exoticize technology,” Peter Thiel says in his book Zero to One: Notes on Startups, or How to Build the Future. But we needn’t be starstruck by big data. There are ways we can sift through this information and impact our business decisions for a good outcome. Specifically, businesses will gain more advantage from data by first employing data analysts, then focusing on smaller, more actionable data.